This ensemble of almshouses about a courtyard was built in 1904 after a design by Gerrit Pelt, who later established the idealistic furniture factory L.O.V. (Labor Omnia Vincit). 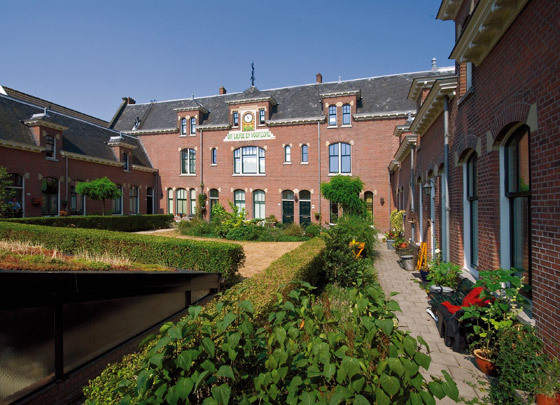 This institution for retired servant girls had since 1794 been housed on Schiedamsesingel. In these later premises the architect had retained the 'Dutch doors' with their separately openable upper and lower parts at the request of the residents. Gracing the farthermost facade is a tablet bearing the institution's name (which literally means 'out of love and precaution') in green and white tiles. The ensemble was renovated in 2000 by the architect Ineke Hulshof.